Chakkakuru Olarthiyathu is the Malayalam term for Jackfruit seeds Stir-Fry. The jackfruit seeds are stir-fried with slices of onions, and spices such as Kadugu (Black mustard), Turmeric powder, red chili powder, freshly grated coconut and curry leaves . 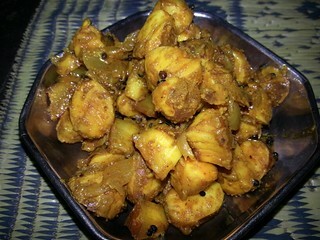 It is one of the dishes made from the different parts of Jackfruit, such as the seeds. Chakkakuru is the Malayalam word for Jackfruit seeds. Chakka is Jackfruit in Malayalam, the language of the Indian state of Kerala. Chakkakuru of Jackfruit seeds is called Buto ng Langka in Filipino. Jackfruit seeds are not made into savory dishes in the Philippines, as far as I know.When I was young, my mother used to gather these seeds whenever she purchased Jackfruit (Langka) then boil them with a bit of salt then serve them to us for snacks. One day when I visit again my country, the Philippines. I want to try cooking Chakkakuru Olarthiyathu and let my siblings enjoy what I have learned during my stay in Kerala, India. 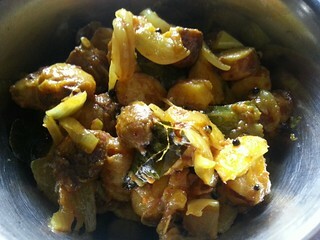 Pictures below are 2 kinds/types of Chakkakuru Olarthiyathu cooked by my family friend in Allepey, Kerala, India. 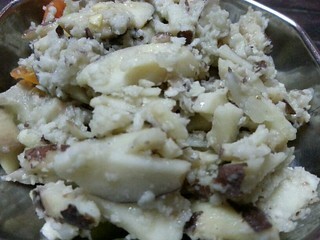 One is with grated fresh coconut without red chili and the other one without grated coconut but with red chili powder. 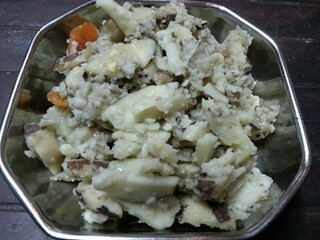 I enjoyed both as I love Chakkakuru, Coconut meat and lots of spices.